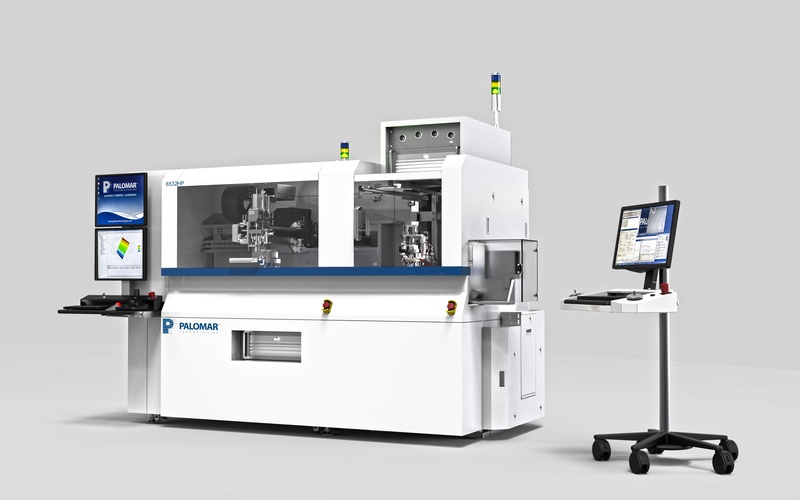 Carlsbad, CA – March 13, 2018 – Palomar Technologies, Inc. is delighted to announce the introduction of their newest die bonding system: the 6532HP (HP for High Precision, High Production, High Performance). Developed for the demanding needs of the optoelectronics industry, the 6532HP exceeds industry standards for placement accuracy, production speed and high volume capacity. The 6532HP delivers 1.5 micron placement accuracy and speeds up to 1200UPH to maximize throughput. Fully automated presentation of dual 8 inch wafers, up to 72 wafflepak/GelPaks™, or tape feeders provides a high production, flexible, parts presentation platform. A 6 position, bi-directional tool turret allows “on-the-fly” tool changes to maximize speed and flexibility. The 6532HP is based on the proven ultra-high accuracy technology of the 6500 Die Bonder, and is designed for the high production needs of optoelectronic device manufacturers. As our connected world grows, the need for data storage, transmission and manipulation has increased dramatically as has the need for packaging systems that create the optoelectronic devices required to drive these networks. The 6532HP was developed with input from key customers globally to ensure it is uniquely positioned to meet these needs now and for future scale up of production. The 6532HP will be introduced this month at SEMICON China in Shanghai and The Optical Networking and Communication Conference & Exhibition (OFC) in San Diego, California. For more information please visit our website at palomartechnologies.com, or contact your Palomar representative. Palomar Technologies, is the global leader of automated high-accuracy, large work area die attach and wire and wedge bond equipment and precision contract assembly services. Customers utilize the products, services and solutions from Palomar Technologies to meet their needs for optoelectronic packaging, complex hybrid assembly and micron-level component attachment.